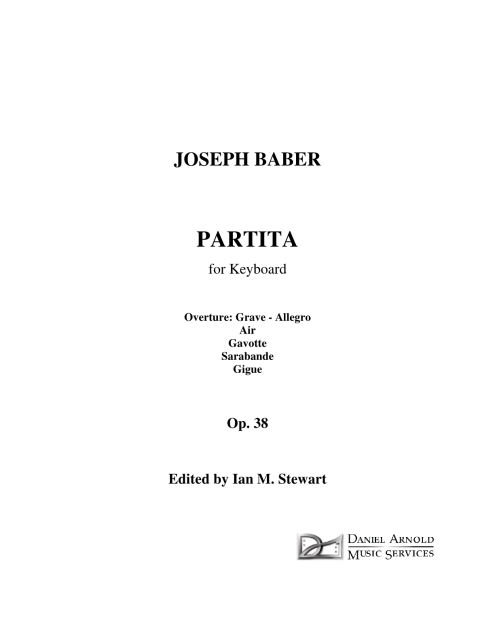 The keyboard Partita is perhaps the most personal of my works. For this reason, and, to a lesser extent, because of a seemingly intractable problem at the end of the Overture, I’ve kept the work to myself since the early 1970’s. All the music written during the creation of the dark, modernist opera, Frankenstein, the first with librettist and novelist, John Gardner, has a severe and hallucinatory quality. However, the Partita, written before the opera’s completion, and during my wife Kazu-e’s final illness, was intended to be a kind of baroque refuge from the opera’s despair and the sadness of events. Still, despite the work’s academic restraint, there are several moments which betray some of the opera’s character, an outburst in the Gigue, for instance, and some of the sadness being experienced at the time, especially in the Air (which Kazu-e loved) and the resigned and painful Sarabande, which I consider my best short work. The idea of writing a Partita came from hearing our friend and accompanist David Yeomans’ brilliant performance of the Bach Sixth English Suite in Kansas during the spring of 1971. Yeomans later became professor of piano of the State University of New York at Fredonia. David Yeomans sent me an impromptu reading of it soon after it was completed. James Bonn gave me a similar private performance at his home around the same time. He later assigned it to one of his students at the University of Southern California, Joanne Kong, who is now a successful harpsichordist/pianist teaching at the University of Richmond in my own home town. William Lutes performed it on a program of my works in Memorial Hall, Wednesday, February 15, 1975. Cathy McGlasson performed and provided and editorial guidance on the work over the years. Erica Rumbley performed the work at the concert inaugurating the Joseph Baber Papers in the Special Collections of the University of Kentucky Libraries. Ian Stewart, the youngest and latest of the musicians who’ve helped me on the Partita, was instrumental in solving the intractable problem mentioned above.